May 19-20 student-led hack event! Please see below for a message from one of the CPS students organizing event0, a student hack event happening on May 19-20. We are Chicode, led by a group of students that want to further computer science in public schools across Chicago! Our end goal is to create a league of hackathons and code meet-ups across the city that are accessible for every CPS student. Throughout the events we will have workshops teaching students various programming languages and technologies, along with mentors to help them get started. We think that this is the best way to increase student involvement in CS, as these events would provide the community aspect necessary to make coding seem fun and approachable. Our first hackathon, event0, is scheduled May 19-20 at ChiTech Academy High School (1301 W 14th St). How Your Students Can Attend event0: Just sign up here! We don’t care how much experience they have in computer science as long as they’re passionate. We know this will be the first hackathon a lot of students have attended, so we’ll have plenty of mentors (both college CS majors and industry professionals) on hand to offer guidance. Potential Leadership Role for an Interested Student: What we need is the contact information of a passionate student that will be able to manage the communications between us and your school — you can submit that through this form. We will work with this student to get your school involved in our event’s outreach as well as any of our other future endeavors! We hope to hear from you, and feel free to email us if you’re interested in talking about computer science or how you could further get involved. Kyla Guru (a non-Lane student), and several other students across the nation, are planning GirlCon, a conference aimed at empowering middle and high school girls. The conference will focus on the role technology has in all fields and that no matter what your passion, an interest in technology can support it. Kyla is an NCWIT Aspirations in Computing award winner, Three Dot Dash Global Teen Leader, and founder of Bits N’ Bytes Cybersecurity. Registration will be opening up next month, so if you or anyone you know are interested in attending, check out the GirlCon site. The Innovation Lab at the Harold Washington Library will be looking for two part time staff soon. The positions aren’t posted yet, but will be soon through www.advancedresources.com. They are part-time, usually 10-12 hrs per week, and the lab is open 1-8 M – Th, and 10-4 Friday and Saturday, so they are looking for people to work those hours. Bit Space is hosting an Open House this Sunday, April 15th from 11:00-4:00 at our Lincoln Square location (2541 W. Lawrence Ave) to celebrate our 3rd anniversary, and we’d love you to join us! The event is free and open to the public (no RSVP required, drop in and stay as long as you like). Please feel free to pass this information along to students, colleagues and friends! We hope to see you at Bit Space this Sunday! Kids and teens ages 6+ will be able to participate in our interactive gaming experience–FORT CIRCUIT. Participants will use saws and drills to help us construct the wooden fort and will build simple circuits to interact with the game. The goal–protect the fort from an onslaught of attacking ducks (with the help of a large quantity of virtual bread products). Learn how woodworking, laser cutting, electronics, 3D modeling, virtual reality and more can come together to create a super fun and engaging experience for kids of all ages. What’s new for educators? Bit Space is the one-stop shop for just about anything you need to join the maker movement. Bit Space provides Professional Development for teachers and staff (design thinking, specific tools and technology, implementing classroom projects); we offer a "maker" curriculum to enhance your current classroom curriculum; and we can even design and build a maker space for you at your school. Bit Space offers field trips, in-school programming, and help with special projects and events. Call us to find out how Bit Space can help you and your students start making! 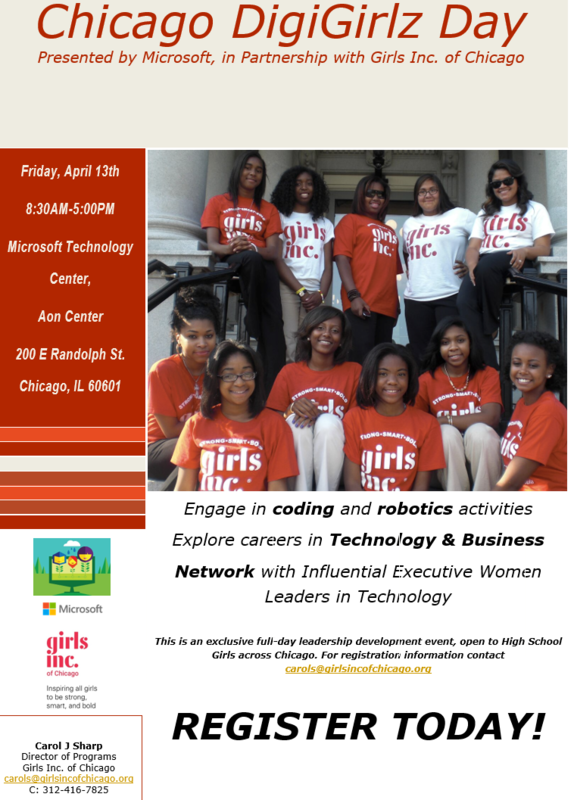 Girls Inc. of Chicago recently partnered with Microsoft, to offer the Chicago DigiGirls Day to high school girls across the city! During the event, 9-12th grade girls will interact with Microsoft employees and managers to gain exposure to careers in business and technology and to get an inside look at what it’s like to work at Microsoft. This exciting event provides girls with career planning assistance, information about technology and business roles, thought-provoking exercises, and interesting Microsoft product demonstrations. By participating in the Microsoft DigiGirlz Day, young women can find out about the variety of opportunities available in the high-tech industry and can explore future career paths. Attn: Seniors with plans to pursue engineering or computer science. The deadline for the Society of Women Engineers Chicago Chapter High School Senior Scholarship Application deadline is April 10, 2018. The Application link is below. The details of the requirements including geographical zip code are stated in the Application. Transcripts and Letters of Recommendation due by April 12, 2018. Are you a student who might be interested in designing solutions to achieve one of the United Nations Global Goals? Open to any 5th-10th grade students that might be interested- Registration extended to April 14th! In partnership with the United Nations Association Chicago Chapter, seeking students in 5th-10th grade for our GEMS Global Design Challenge! Over the course of April 21st and 22nd, students choose 1 of the 5 thematic Global Goals and work in teams, with the help of industry mentors, to ideate, design, and construct a solution to help achieve the goal. Prizes will be awarded for the top 3 overall teams! National Geographic Education has donated some sweet swag for the raffle. Lemelson-MIT will be present at the challenge to provide a special award for the best high school team with a useful and unique product idea! Seniors – Lane Tech Alumni Association Scholarships are Live! At this time, there are 10 scholarships available with 7 additional scholarships on the way! This year the AA will be offering nearly $250,000 in scholarships to the Seniors at Lane Tech. *Please note- students must register with the Alumni Association to apply. The registration approval process may take up to 24 hours- so please apply early!